As has been all over the news, political activists are using a hideous crime to force removal of the Confederate battle flag from the grounds of the South Carolina state capitol and everywhere else from which they can shame it away. Numerous multinational retail outlets now refuse to sell the flag, as is their right. In addition, the people of the state of South Carolina have the right to decide what decorations will adorn the grounds of their state Capitol. I think that it is best that the flag not be there, given the sensitivities with which it is regarded by so many people of that state. There is a word for such efforts to suppress others’ free expression of thoughts: censorship. The equation of confederacy and slavery is certainly tendentious. The Confederate flag, like the Confederacy itself, never stood strictly for support of slavery. 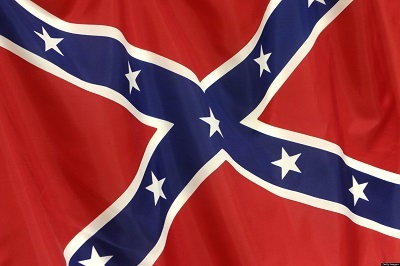 On the contrary, it was always a symbol of the South’s willingness to defend their states’ sovereignty from what they (correctly) saw as a political trend that would ultimately make them a second-class region (because of a proliferation of non-slave states as the nation grew westward) and destroy their economy and livelihood. It was a movement of resistance to big government and the tyranny of the majority. It is true, and tragic, that the secession declarations of some of the Southern states prominently mentioned slavery as a reason for their desired departure from the union. It is also true that twentieth-century racists used it as a symbol of their vile hatreds. None of that, however, explains why so many Southerners fought for the cause in the Civil War. Before the war, free blacks in the South were legally as free as whites; in the wake of the war and the big-government efforts of Reconstruction, all blacks in the South were oppressed, by their state governments, all of which were ruthlessly controlled by Democrats. Preventing just such a catastrophe was why the commoners in the South fought: not for the right to keep slaves but for each individual’s very right to exist as a free American. And that was why they were proud of having fought even though they lost. And that is what the flag stands for among those of good will. Today, obliterating that kind of independent thinking is what the movement to suppress the Confederate flag is all about. It should hardly surprise us when censors set out to suppress independent thought.